Chapter I • Bourgeois and ProletariansBy bourgeoisie is meant the class of modern capitalists, owners of the means of social production and employers of wage labour. The history of all hitherto existing societyThat is, all written history. In 1847, the pre-history of society, the social organisation existing previous to recorded history, all but unknown. Since then, August von Haxthausen (1792-1866) discovered common ownership of land in Russia, Georg Ludwig von Maurer proved it to be the social foundation from which all Teutonic races started in history, and, by and by, village communities were found to be, or to have been, the primitive form of society everywhere from India to Ireland. The inner organisation of this primitive communistic society was laid bare, in its typical form, by Lewis Henry Morgan’s (1818-1881) crowning discovery of the true nature of the gens and its relation to the tribe. With the dissolution of the primeval communities, society begins to be differentiated into separate and finally antagonistic classes. I have attempted to retrace this dissolution in The Origin of the Family, Private Property, and the State, second edition, Stuttgart, 1886. [Engels, 1888 English Edition and 1890 German Edition (with the last sentence omitted)] is the history of class struggles. Freeman and slave, patrician and plebeian, lord and serf, guild-masterGuild-master, that is, a full member of a guild, a master within, not a head of a guild. [Engels, 1888 English Edition] and journeyman, in a word, oppressor and oppressed, stood in constant opposition to one another, carried on an uninterrupted, now hidden, now open fight, a fight that each time ended, either in a revolutionary reconstitution of society at large, or in the common ruin of the contending classes. “Commune” was the name taken in France by the nascent towns even before they had conquered from their feudal lords and masters local self-government and political rights as the “Third Estate.” Generally speaking, for the economical development of the bourgeoisie, England is here taken as the typical country, for its political development, France. [Engels, 1888 English Edition]: here independent urban republic (as in Italy and Germany); there taxable “third estate” of the monarchy (as in France); afterwards, in the period of manufacturing proper, serving either the semi-feudal or the absolute monarchy as a counterpoise against the nobility, and, in fact, cornerstone of the great monarchies in general, the bourgeoisie has at last, since the establishment of Modern Industry and of the world market, conquered for itself, in the modern representative State, exclusive political sway. The executive of the modern state is but a committee for managing the common affairs of the whole bourgeoisie. By bourgeoisie is meant the class of modern capitalists, owners of the means of social production and employers of wage labour. “Home Colonies” were what Owen called his Communist model societies. Phalanstéres was the name of the public palaces planned by Fourier. Icaria was the name given to the Utopian land of fancy, whose Communist institutions Cabet portrayed. [Note by Engels to the German edition of 1890.] — duodecimo editions of the New Jerusalem — and to realise all these castles in the air, they are compelled to appeal to the feelings and purses of the bourgeois. By degrees, they sink into the category of the reactionary [or] conservative Socialists depicted above, differing from these only by more systematic pedantry, and by their fanatical and superstitious belief in the miraculous effects of their social science. “Workers of the World, Unite. You have nothing to lose but your chains!” is a popularisation of the last three sentences, and is not found in any official translation. Since this English translation was approved by Engels, we have kept the original intact. against the conservative and radical bourgeoisie, reserving, however, the right to take up a critical position in regard to phases and illusions traditionally handed down from the great Revolution. The Communist League, an international association of workers, which could of course be only a secret one, under conditions obtaining at the time, commissioned us, the undersigned, at the Congress held in London in November 1847, to write for publication a detailed theoretical and practical programme for the Party. Such was the origin of the following Manifesto, the manuscript of which travelled to London to be printed a few weeks before the February [French] Revolution [in 1848]. First published in German, it has been republished in that language in at least twelve different editions in Germany, England, and America. It was published in English for the first time in 1850 in the Red Republican, London, translated by Miss Helen Macfarlane, and in 1871 in at least three different translations in America. The french version first appeared in Paris shortly before the June insurrection of 1848, and recently in Le Socialiste of New York. A new translation is in the course of preparation. A Polish version appeared in London shortly after it was first published in Germany. A Russian translation was published in Geneva in the sixties[A]The first Russian translation of the Manifesto of the Communist Party was made by Bakunin, who despite being one of Marx and Engels’ most pronounced opponents in the working class movement, saw the great revolutionary importance contained within the Manifesto. Published in Geneva in 1869 (printing it in Russia was impossible due to state censorship), Bakunin’s translation was not completely accurate, and was replaced a decade later by Plekhanov’s translation in 1882, for which both Marx and Engels wrote a preface.. Into Danish, too, it was translated shortly after its appearance. The first Russian edition of the Manifesto of the Communist Party, translated by Bakunin[A]The first Russian translation of the Manifesto of the Communist Party was made by Bakunin, who despite being one of Marx and Engels’ most pronounced opponents in the working class movement, saw the great revolutionary importance contained within the Manifesto. Published in Geneva in 1869 (printing it in Russia was impossible due to state censorship), Bakunin’s translation was not completely accurate, and was replaced a decade later by Plekhanov’s translation in 1882, for which both Marx and Engels wrote a preface., was published early in the ’sixties by the printing office of the Kolokol [reference to the Free Russian Printing House]. Then the West could see in it (the Russian edition of the Manifesto) only a literary curiosity. Such a view would be impossible today. And now Russia! During the Revolution of 1848-9, not only the European princes, but the European bourgeois as well, found their only salvation from the proletariat just beginning to awaken in Russian intervention. The Tsar was proclaimed the chief of European reaction. Today, he is a prisoner of war of the revolution in Gatchina[B]A reference to the events that occurred in Russia after the assassination, on March, 1, 1881, of Emperor Alexander II by Narodnaya Volya members. Alexander III, his successor, was staying in Gatchina for fear of further terrorism., and Russia forms the vanguard of revolutionary action in Europe. When the European workers had recovered sufficient strength for another attack on the ruling classes, the International Working Men’ s Association sprang up. But this association, formed with the express aim of welding into one body the whole militant proletariat of Europe and America, could not at once proclaim the principles laid down in the Manifesto. The International was bound to have a programme broad enough to be acceptable to the English trade unions, to the followers of Proudhon in France, Belgium, Italy, and Spain, and to the Lassalleans in Germany.Lassalle personally, to us, always acknowledged himself to be a disciple of Marx, and, as such, stood on the ground of the Manifesto. But in his first public agitation, 1862-1864, he did not go beyond demanding co-operative workshops supported by state credit. 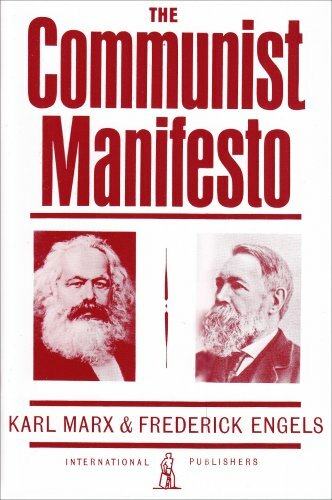 Yet, when it was written, we could not have called it a socialist manifesto. By Socialists, in 1847, were understood, on the one hand the adherents of the various Utopian systems: Owenites in England, Fourierists in France, [See Charles Owen and François Fourier] both of them already reduced to the position of mere sects, and gradually dying out; on the other hand, the most multifarious social quacks who, by all manner of tinkering, professed to redress, without any danger to capital and profit, all sorts of social grievances, in both cases men outside the working-class movement, and looking rather to the “educated” classes for support. Whatever portion of the working class had become convinced of the insufficiency of mere political revolutions, and had proclaimed the necessity of total social change, called itself Communist. It was a crude, rough-hewn, purely instinctive sort of communism; still, it touched the cardinal point and was powerful enough amongst the working class to produce the Utopian communism of Cabet in France, and of Weitling in Germany. Thus, in 1847, socialism was a middle-class movement, communism a working-class movement. Socialism was, on the Continent at least, “respectable”; communism was the very opposite. And as our notion, from the very beginning, was that “the emancipation of the workers must be the act of the working class itself,” there could be no doubt as to which of the two names we must take. Moreover, we have, ever since, been far from repudiating it. “Working men of all countries, unite!” But few voices responded when we proclaimed these words to the world 42 years ago, on the eve of the first Paris Revolution in which the proletariat came out with the demands of its own. On September 28, 1864, however, the proletarians of most of the Western European countries joined hands in the International Working Men’ s Association of glorious memory. True, the International itself lived only nine years. But that the eternal union of the proletarians of all countries created by it is still alive and lives stronger than ever, there is no better witness than this day. Because today[C]This preface was written by Engels on May 1, 1890, when, in accordance with the decision of the Paris Congress of the Second International (July 1889), mass demonstrations, strikes and meetings were held in numerous European and American countries. The workers put forward the demand for an 8 hour working day and other demands set forth by the Congress. From that day forward workers all over the world celebrate the first of May as a day of international proletarian solidarity., as I write these lines, the European and American proletariat is reviewing its fighting forces, mobilized for the first time, mobilized as one army, under one flag, for oneimmediate aim: the standard eight-hour working day to be established by legal enactment, as proclaimed by the Geneva Congress of the International in 1866, and again by the Paris Workers’ Congress of 1889. And today’ s spectacle will open the eyes of the capitalists and landlords of all countries to the fact that today the proletarians of all countries are united indeed. Lassalle personally, to us, always acknowledged himself to be a disciple of Marx, and, as such, stood on the ground of the Manifesto. But in his first public agitation, 1862-1864, he did not go beyond demanding co-operative workshops supported by state credit. [A] The first Russian translation of the Manifesto of the Communist Party was made by Bakunin, who despite being one of Marx and Engels’ most pronounced opponents in the working class movement, saw the great revolutionary importance contained within the Manifesto. Published in Geneva in 1869 (printing it in Russia was impossible due to state censorship), Bakunin’s translation was not completely accurate, and was replaced a decade later by Plekhanov’s translation in 1882, for which both Marx and Engels wrote a preface. [B] A reference to the events that occurred in Russia after the assassination, on March, 1, 1881, of Emperor Alexander II by Narodnaya Volya members. Alexander III, his successor, was staying in Gatchina for fear of further terrorism. [C] This preface was written by Engels on May 1, 1890, when, in accordance with the decision of the Paris Congress of the Second International (July 1889), mass demonstrations, strikes and meetings were held in numerous European and American countries. The workers put forward the demand for an 8 hour working day and other demands set forth by the Congress. From that day forward workers all over the world celebrate the first of May as a day of international proletarian solidarity. One Comment to "The Communist Manifesto"
Wrong-footed, right from the start; the history of humanity is the history of racial and ethnic struggle; class struggle has only obtained within races and ethnic groups. Perhaps this is the kernel of communism’s goal – divide and conquer races and ethnies by turning their aggression inward; create imaginary class solidarity across races and ethnies to further erode nations. But ultimately it all seems to be a scam intended to sucker the “proletariat” into enabling alien (or at least novel), hostile elites to decapitate and replace native elites; out of the frying pan, and into the fire.